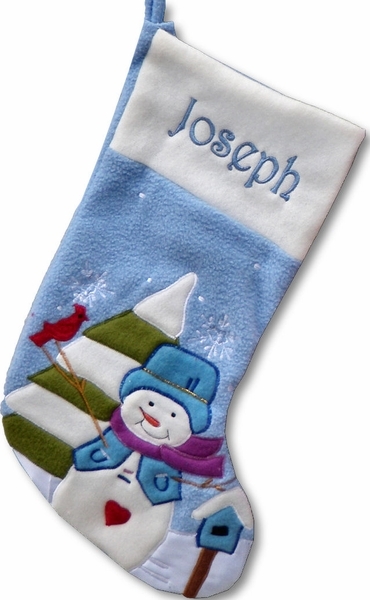 The winter white and blue fleece stocking is accented with an adorable snowman, tree, red robin and bird house. The snowman is wearing a blue hat and vest and purple scarf. It does has a matching sister pink fleece snowman so you can make a set for your son and daughter. Measured 18 inches along the diagonal from the top of the cuff to the toe, and is 7.5 inches wide across the cuff. Materials: Stocking is made out of soft Fleece with intricate snowman design and a white cuff. Lining: YES. This stocking is lined with white satin material.